This luxury camping site located in the popular French Riviera offers holiday makers a choice of first-class, five star, luxury mobile homes. You can choose your view as well as your required accommodation; facing the sea, or nuzzled deep within lush, surrounding gardens. 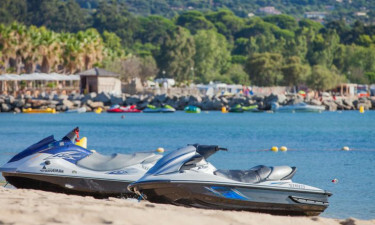 Overlooking the famous St Tropez bay, Les Prairies de la Mer holiday resort offers a peaceful, relaxing atmosphere that suits both couples and families alike. To get started on your dream camping holiday, contact LuxCamp to check availability now. What's special about Les Prairies de la Mer camp site? Magnificent views and easy access to the St Tropez Bay. Onsite facilities include a relaxing spa, wellness centre, and beauty salon. Luxury five star mobile homes, equipped with extras. Tranquil environment that lends a peaceful and relaxed atmosphere that both families and couples can enjoy. At Les Prairies de la Mer holiday resort, luxury camping is all about you. If you're looking to relax and unwind, you'll find a variety of ways to do just that. The site has many attractions, but for those seeking a little 'me time', the resident onsite spa has to beat them all. The spa is professionally run with trained staff and it provides a choice of pampering treatments to help you get into the holiday spirit. Kick back and have a massage to the sound of the rolling beach waves, enjoy a glass of wine in the open-air jacuzzi, opt for one of their heavenly facials or take a leisurely soak in a customary hammam bath. The bay of St Tropez is renowned for its chic style and regular visiting fashionastas. The land side is home to an array of expensive and dazzling restaurants, bars and coffee shops, most notably the Sénéquier, known for it's quirky, triangular-shaped tables and movie star chairs. If you fancy a ramble, head on over to the port side, and take in the breath-taking splendour of the moored yachts. The village itself is a shopping haven filled with eye-catching designer outlets. You can pop into the local parish church where you'll find a bust of the Roman soldier whose name was St Tropez. If you tire of the easygoing pace at Les Prairies de la Mer, don't worry there's plenty of physical activities on offer too. On site there's a wide range of classes you can participate in. How about a spot of Pilates to loosen up your limbs, or take a salsa dancing class for a bit of fun. There's a water sports centre where you can go kayaking, scuba diving, parasailing and windsurfing. There's also a fully equipped modern gym on the camping site for keep-fit enthusiasts and the site staff regularly organizes sports tournaments that families can enjoy together.